RCM, the complete through wall solutions supplier is delighted to announce the addition of Abet Laminati MEG HPL facade to its already impressive portfolio. Robust, compact and long-lasting, MEG – Material Exterior Grade building facade by Abet Laminati is specifically designed for outdoor applications. This versatile and durable range is made up of a rigid core combined with a decorative surface consisting of weather-resistant thermosetting resins. 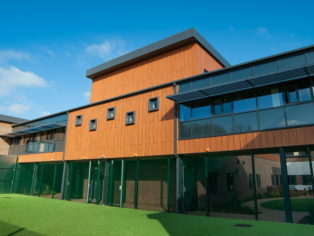 The high pressure laminate (HPL) is often used as rainscreen cladding, as well as on balconies. Having the BBA Agrément certificate makes MEG an ideal choice for architects and with 58 colours, 31 woodgrains, 5 concrete and metal effect finishes the possibilities are huge. The new agreement between RCM and Abet Laminati to supply MEG facades follows RCM celebrating a most promising start to the year with ever increasing orders in their facade ranges. Supplying specialist building boards, facades, breather membranes and airtightness solutions, RCM offers a fully integrated approach to the building envelope while delivering on time and budget. RCM are a market leader in providing innovative products and solutions designed and tested to meet the demanding needs of construction. Specified for use in external facades, fire protection, acoustic, airtightness and decorative applications, RCM’s extensive portfolio has been installed on many of the UK’s largest projects.